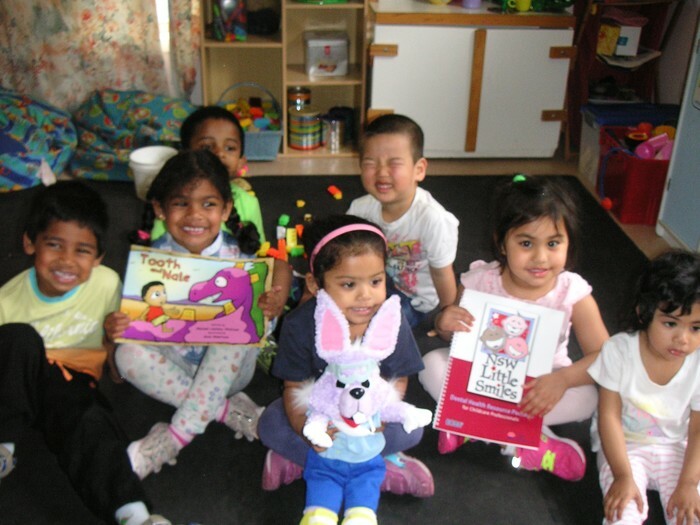 Welcome to our final newsletter of 2015! 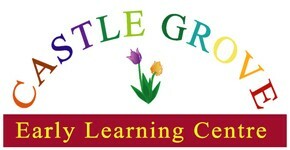 Castle Grove Early Learning Centre will be closing over the holidays! Our last day of 2015 will be Thursday, 24th December 2015. We'll be back for the new year on Monday, 4th January 2016. We've had a busy year full of learning, friendship and fun. So before we head off for the year, here's a reminder of what we've been doing in the last couple of months. We wish everyone a wonderful holiday with family and friends and look forward to seeing you in the New Year. We spent some time learning all about how our bodies work. 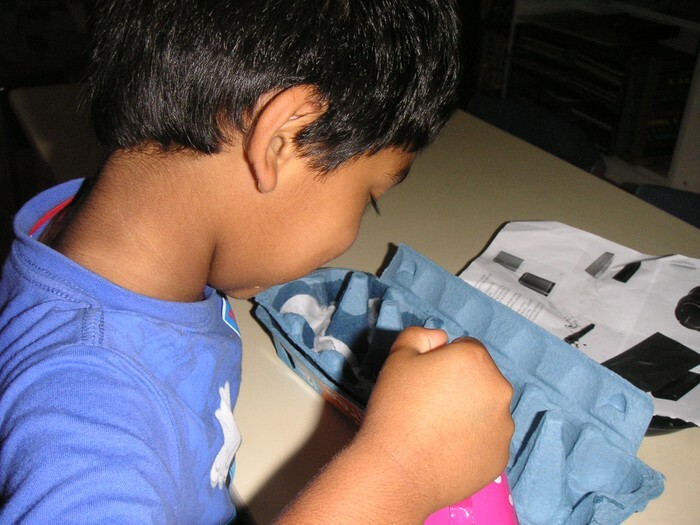 Some of the systems we learned about included: the respiratory system (breathing) and digestive system. 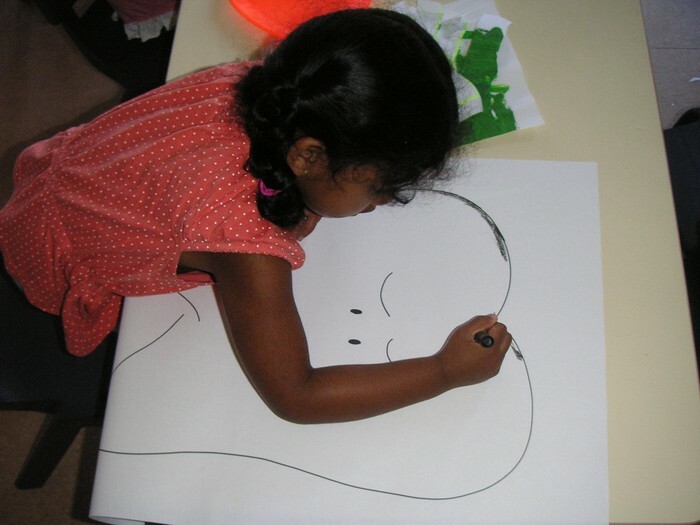 We also had a special project about pregnancy and birth to learn about what mummy went through while we were growing in her tummy, and also how we grew up gradually day by day from a tiny cell in mum's tummy to being born and then continuing to develop, grow and learn. Miss Jodie helped us attach the parts of the digestive system for our craft project. Jayme and Ciarna have dolls tied around their tummy's to experience how mummy felt while she was pregnant with them. We all worked as a group to complete our digestive system craft project! We also discussed the importance of Dental Hygiene! These are just some ways we learned to help keep our teeth strong and healthy. 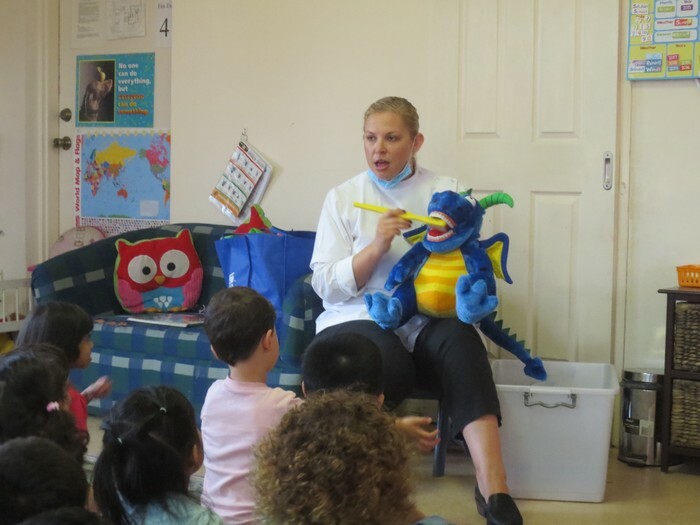 We were also lucky to have a special incursion from the dentist to teach us all about maintaining healthy and hygienic teeth! 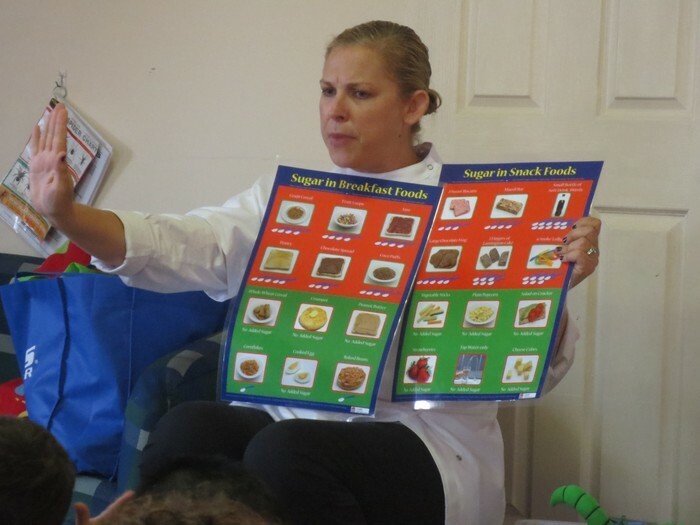 We learned about which foods are good for our teeth, and which are read. We made an interactive project to differentiate between good and bad foods and which create HAPPY teeth, and which create SAD teeth. 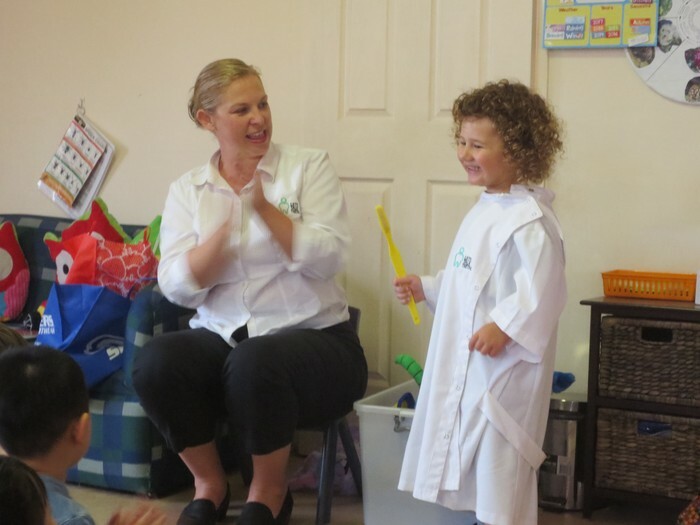 The dentist used the dinosaur and large toothbrush to demonstrate the correct way to brush! We also had a turn to dress up as a dentist! We were excited to use our special dental hygiene resources to continue and extend on our learning. 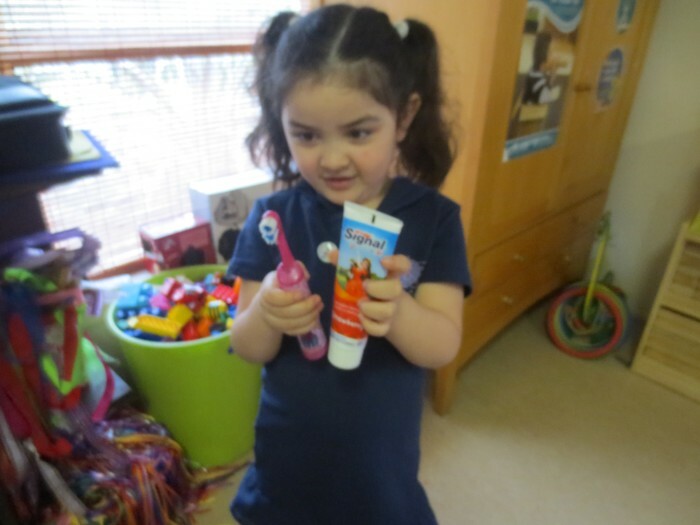 Anika brought her toothbrush and toothpaste for show-and-tell! Just in time with the start of spring we decided on this as our learning focus. 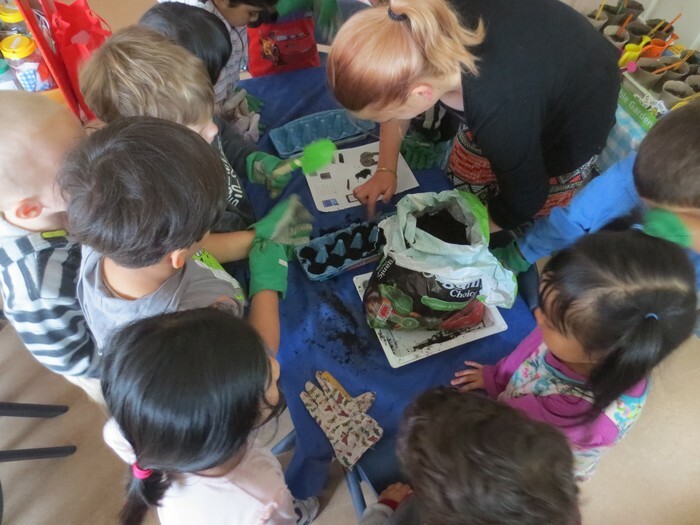 We took the opportunity to spend some time in our school garden and plant some vegetable seeds to add to our veggie garden. We planted a large variety of foods such as : beans, spring onions, carrots, broccoli, lettuce and more. We let them grown in seedling trays until they sprouted enough and then transferred them into the garden beds outside. We can't wait until they're all ready for harvest. 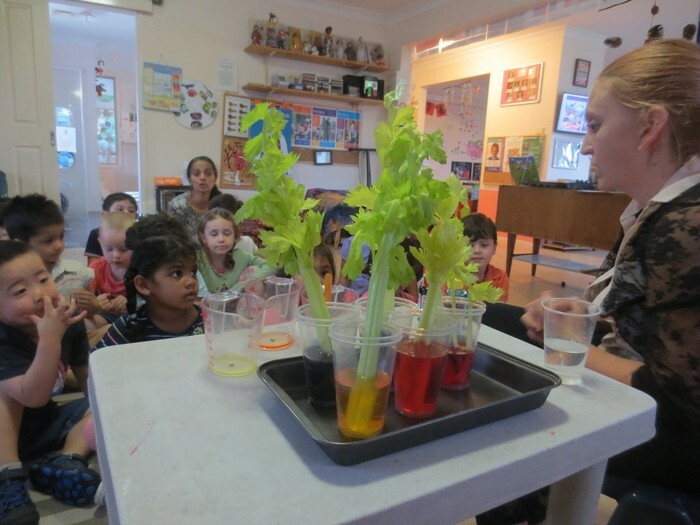 We also did an experiment to understand the concept of water absorption and how plants use the water which they retrieve through the roots to feed the entire plant. The start of the experiment. 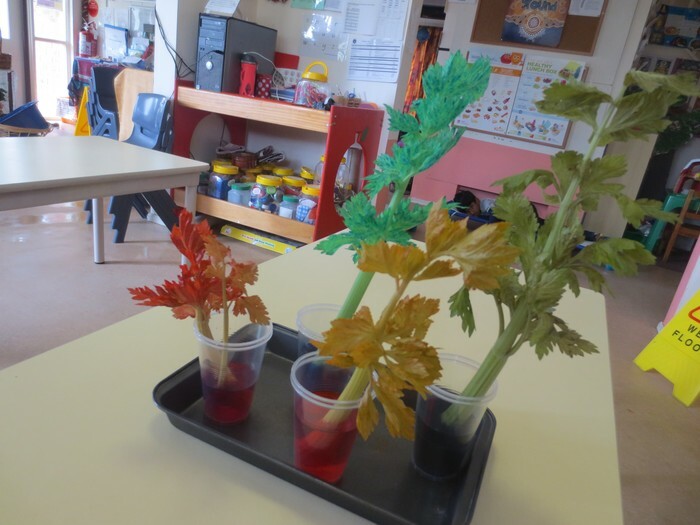 Each celery stalk is placed in a cup with coloured water. After a couple of days the leaves have started to turn the same colour as the water which has been feeding the plant. 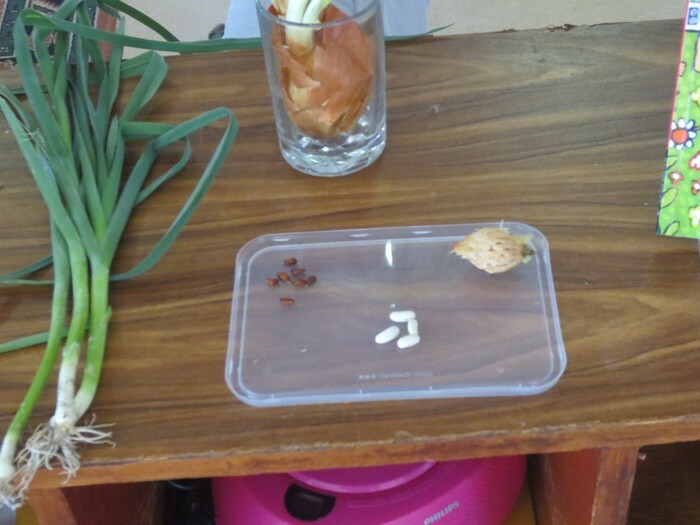 We displayed the seeds to see how they all differ from one another. 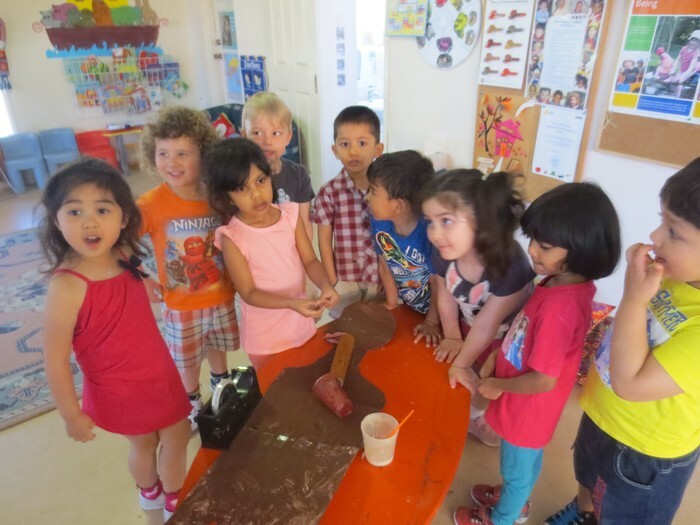 A fun learning focus was all about birthdays, parties and celebrations from around the world! 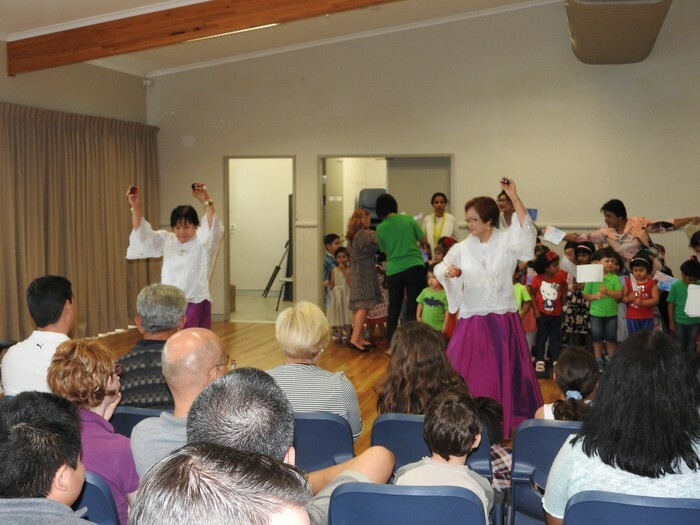 Some of the cultures celebrations we learned about included: Mexican, Indian, Chinese and German. 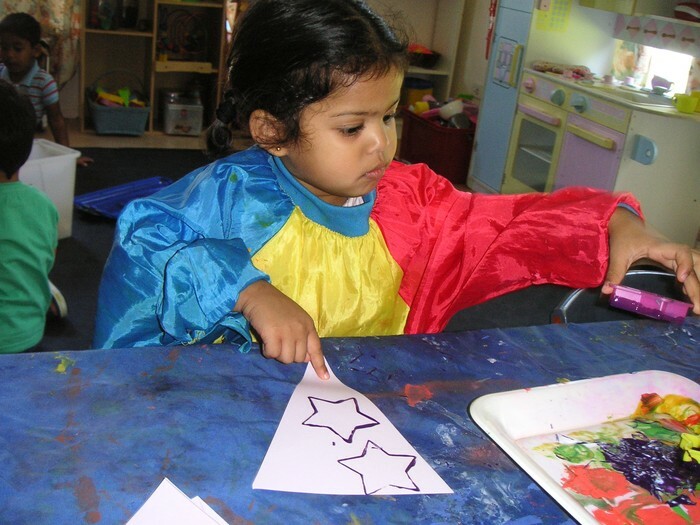 Leanne used stamps and paint to decorate her triangle for the bunting (Which is traditionally used in barn dance parties, but nowadays due to variety of styles and patterns it is used for many celebrations like baby showers, weddings etc). 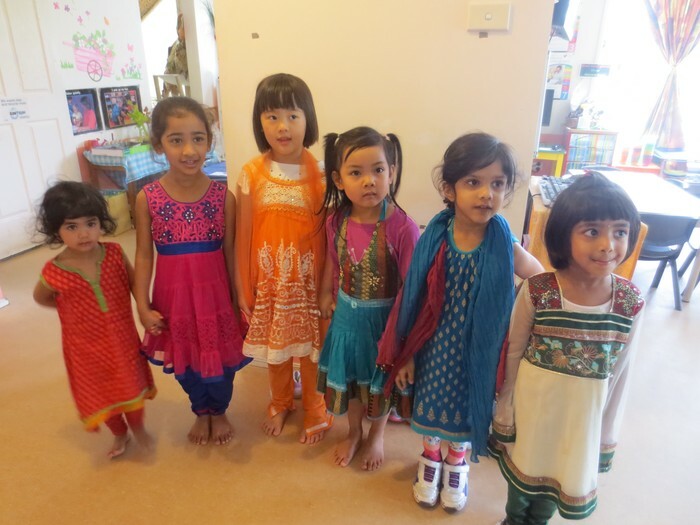 The girls all dressed up in some traditional Indian outfits for Diwali. Thank You, Mahi for sharing some of your beautiful clothes. We learned a fun line dance together with a youtube tutorial. 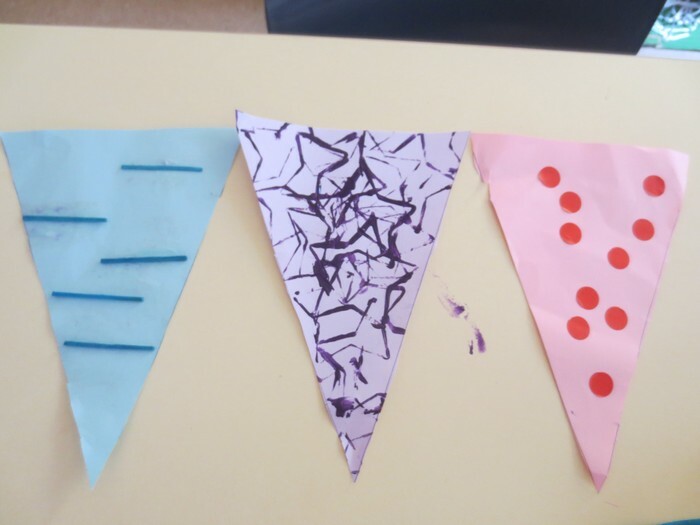 Each group used a unique colour and pattern for the bunting we made. We attached them all together and used it to decorate one of our classes. 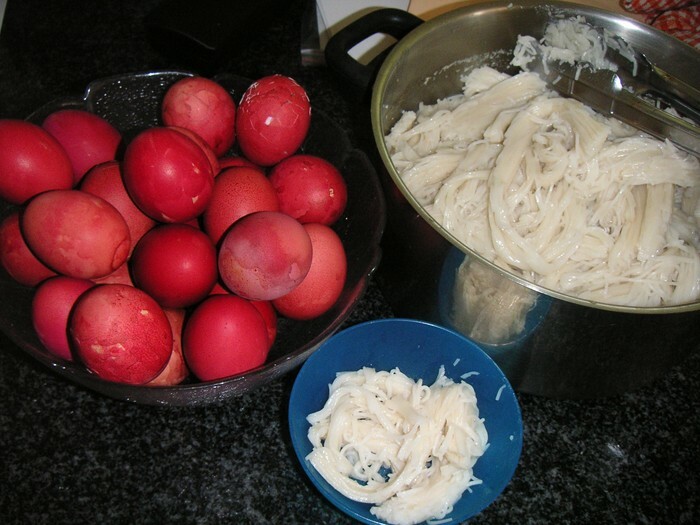 We had some traditional red eggs and noodles for lunch when we learned about the Chinese birthday celebration. 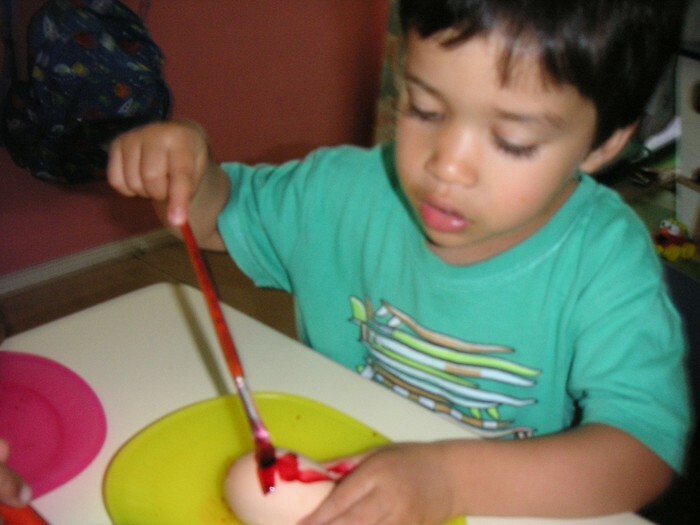 We each painted our own egg with read food colouring. 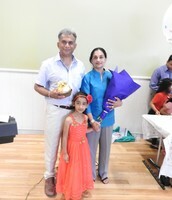 Our End of Year Concert. THANK YOU to Xavier's grandma for her performance at the concert. We really enjoyed it! 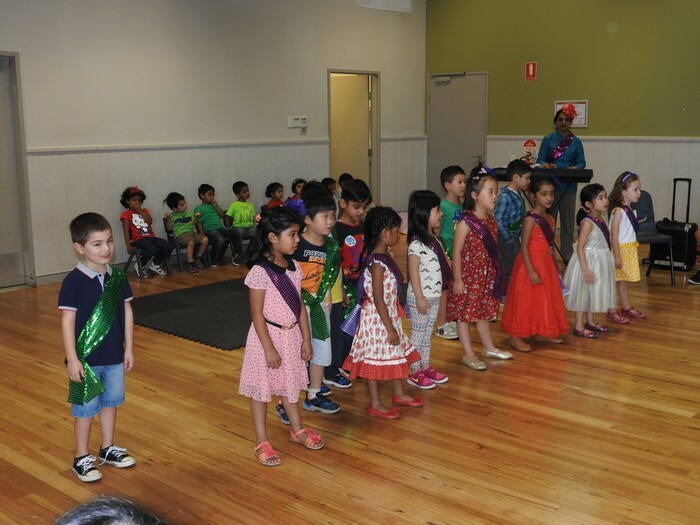 We were so excited to share our prepared songs and dances with all our families and friends at the end of year concert! Thank you to everyone for coming to support it. We hope you enjoy the photos. Xavier's grandma doing her dance performance. Getting ready for our performance! 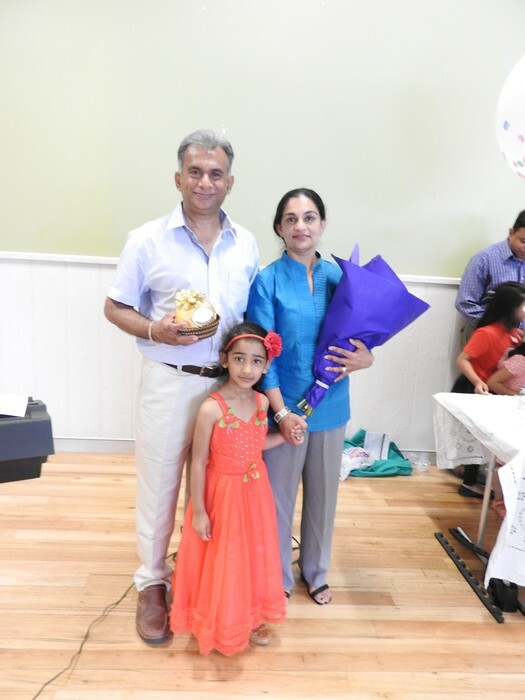 Mahi helped to present Ms Roshini and Uncle Nalin with a small token of our gratitude for everything they have done for all of us at the centre! Thank You Again for another incredible year. 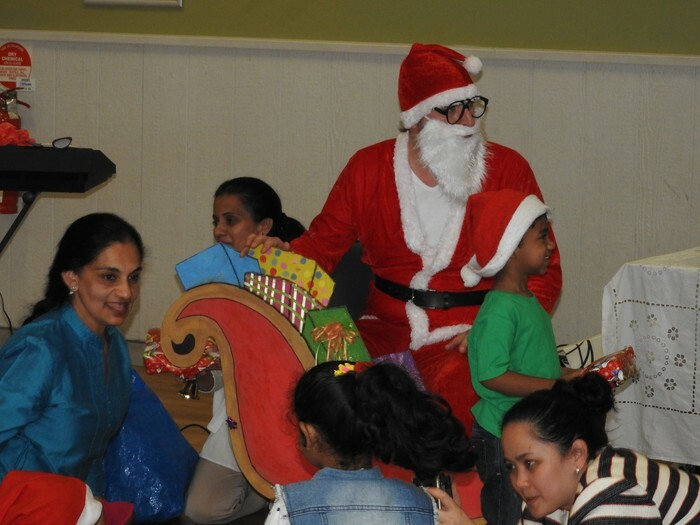 We received a surprise visit from Santa who spent some time to treat each of us to a gift after our concert. 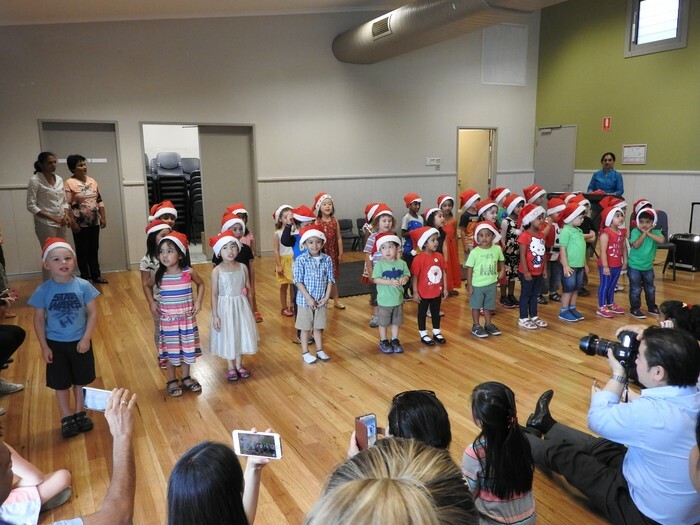 Dressed in our Christmas hats we sang 'Santa Claus is coming to Town' and 'We wish you a Merry Christmas'. 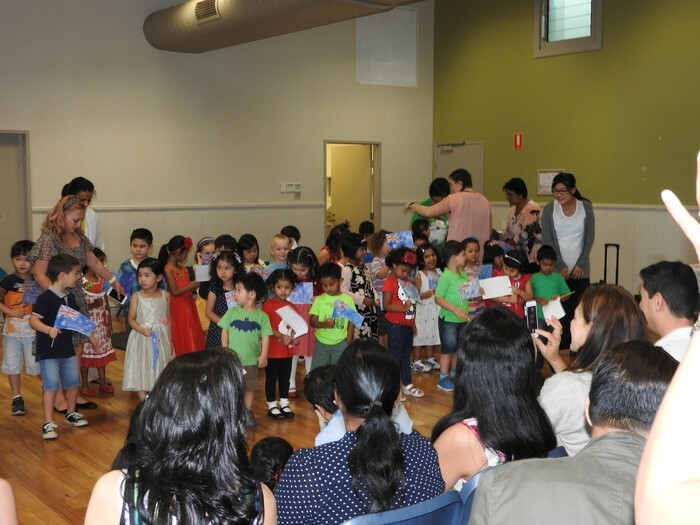 The graduation group sang the song 'When You're Smiling'. They practiced some rythmic clapping and stamping along to the lyrics before singing the full song. 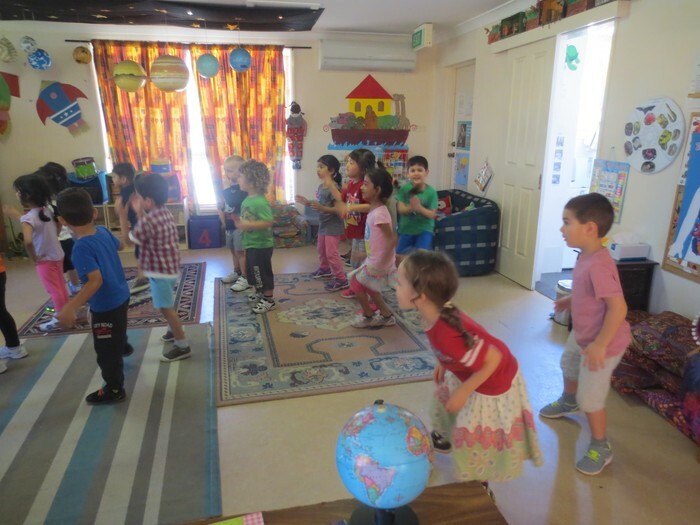 The upstairs group danced to 'Singin' in the Rain'. 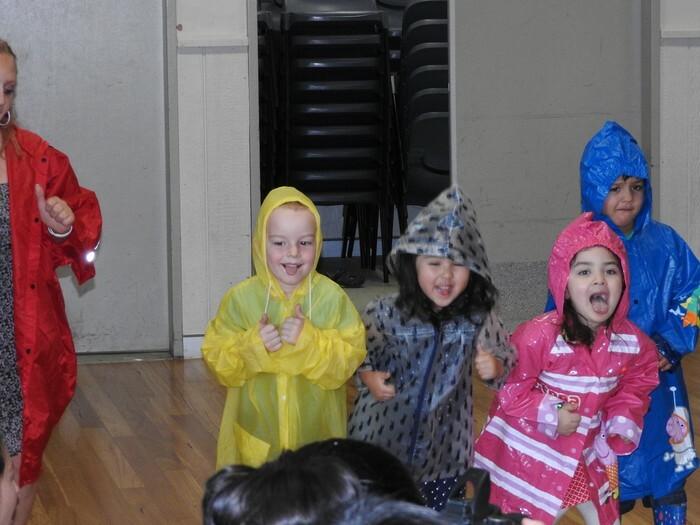 They dressed up in Raincoats & Gumboots for a fun filled performance. 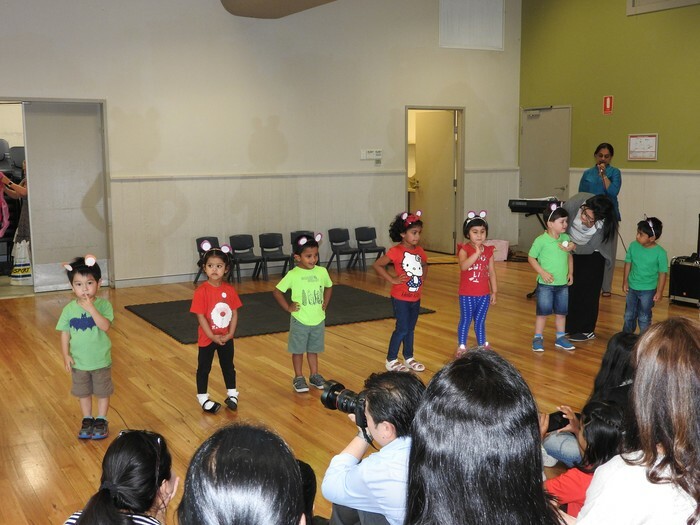 The 2-3 group enjoyed performing one of their favourite songs 'I'm a Gummy Bear!'. 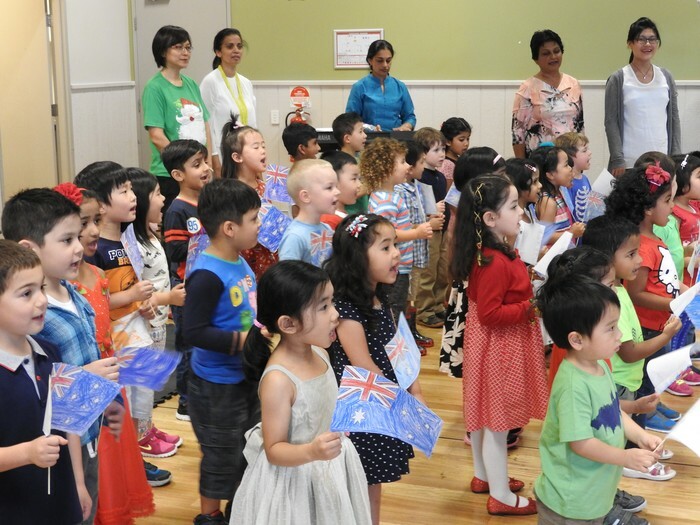 We started our performance by singing all together the Australian national anthem. The following children will be Celebrating their Birthday's over the holiday period.